Organizing tips to help the busy professional and the entrepreneur evict the "clutter giant" from their home, work and storage spaces. Home-based Business Moving/Relocation series (Pt.4): Cord Organization…don’t get it twisted. They can be a pain. How many times have we run across the ever-so frustrating act of trying to pack for a move, or just to travel, and encounter the daunting task of unplugging, detangling, and wrapping cords from a dozen different devices/machines? Oh, no… that’s just the beginning! Then when it’s time to unpack them we have to remember what they belonged to?.. Is the location of the cord (once it’s hooked up) within reach of an outlet?.. Are there too many cords over here?… Where’s that cord?! Uuuuggghhh! Yeees! We know it all too well. It’s enough to drive you crazy! This is how chaotic and crafty that elephant can be when you let it take control. But there is good news… there are ways of eliminating, even avoiding, that intertwining mess no matter what your particular situation. May be it’s not an issue of the number of cords but organizing or storing them in a way that they don’t become a major eye-sore. Although I just moved, I’ve found that I have to get a little creative with the cords around my work area. I finally got the room organized the way I wanted, everything in its perfect place but now I have this unsightly view near my desk and it’s driving me CRAZY! So instead of just hiding it behind my shredder (because even though it’s all somewhat hidden, it still bothers me with a passion), I’ve decided to embrace the challenge of finding the perfect solution to clear it up. 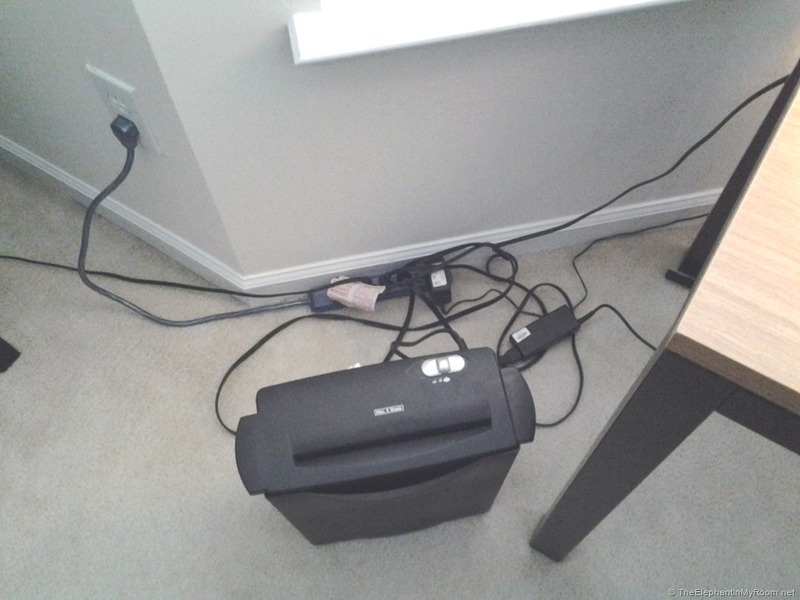 “SO… I’LL SEE YOUR CORD CLUTTER, “ELEPHANT”, AND RAISE YOU A COUPLE MORE CORDS ON THE OTHER SIDE OF MY DESK!.. On to one of my favorite things… shopping! First thing’s first, when removing your cords from your devices/machines, be sure to label each one according to what they belong to. You can use a label maker or special tag to do this. There are a number of different products out there that you can use to label cords. Find the one that works best for you. If you have a drawer full of extra cords, wrap them individually with something such as a rubber band and label them as well. So the next time you need a spare cord, you’ll know what they belong to without having to shuffle through a bunch of cords to find what you need. TAKE IT UP A NOTCH: if you have a number of cords that need to be stored away, create an organized drawer system specifically for them where you can label the front of the drawers according to the type of devices/machines. You’d still be labeling the cords as well but by labeling the drawers, in addition, you can get to what you specifically need even quicker. This is also a big help to business owners who have a shared space with a business partner or team members/employees. You have to think of everyone who works in that same space. When packing your cords, try to store your cords in the same box/bin as their devices/machines. If you have a number of extra cords, pack all like cords together. So if you have more than a couple of the same type of laptop cords, label them and put them all in the same box/bin. By taking this approach, when you unpack, it will just be a matter of storing them away. Once you’ve moved into or arrived at your final destination, store your cords in the room where they will be used. Trust me, it’s no fun trying to remember where you put a cord when you’re short on time or battery power. Inspect all your cords to be sure that they are in good condition. 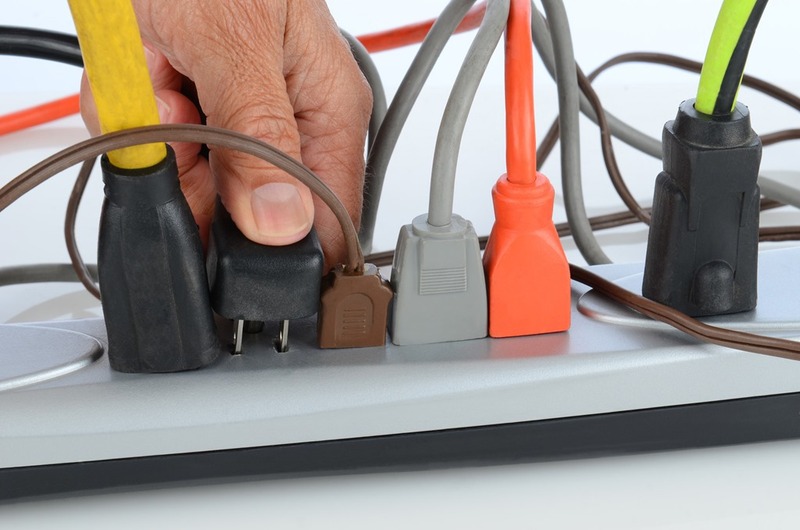 If you notice signs of wear-and-tear, such as exposed wires, consider the cord dangerous then discard and replace it. SIDE NOTE: Cords such as USB cables can be a headache after a while of continued use. If you’ve noticed that your devices are not charging as they should from the connection of your laptop or computer, check the drive that your USB cable is connected to. The cable could in fact be the problem. You can either try another drive on your laptop or computer or you may have to just replace the USB cable. Once you get situated, Invest into some handy cord organizers to help you keep those cords easily accessible and neat behind or beside your work area. I hope these tips have been helpful to you. Feel free to share any ideas you’d like to add below in the comments and, hey, help some other home-based business owners, too, by sharing these posts with them also. Happy 4th from TheElephantInMyRoom.net!.. and 10 Awesome Travel tips and tricks whether it’s business or pleasure! An awesome and fierce wife, entrepreneur, motivator, and mom of three. I love music, writing, light reading, repurposing projects, home organizing, shopping... and I absolutely love high heel shoes! I have such a passion for helping others to shine their brightest, personally and professionally. You'd be surprised at how a simple change in environment can change a person's world.